With a ringing endorsement from Keith Richards mother who described them asoutstanding and fit to stand in for the Stones, backed up by his daughter, Angela - it was eerily like watching my dad... we hope you can guess their name. They are the RollinStoned and, in the words of one Times reviewer who claims to have seen them all, are In my view the nearest thing to the real article, About as true to the originals as you can get raved another and Just like the real thing enthused rock star photographer Gered Mankowitz at his recent private view. So its not just their enthusiastic fans who rate the RollinStoned so highly, it is the people in the know from the Stones inner circle. As for their game?, well the costumes are shamelessly camp gaudy and fab, the instruments all genuinely vintage and the wit irreverent. However while the tongue is never far from the cheek with the RollinStoned, it is never at the expense of the music, This band is not to be confused with the grotesque parody on parody 'Stella Street'-Lite Stones bands that abound, nor a bunch of seasoned old pros, opportunistically hitched on to the Tribute Bandwagon for an easy ride. To paraphrase another, who famously had problems with the buttons on his trouseres "Its the music stupid" and what clearly comes across when seeing this band at work is the passion they all have for the music. 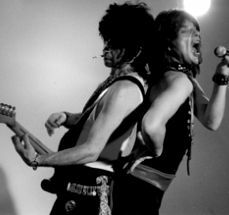 Their two hour shows include not only all the classic crowd pleasing hits, but are spiced with enough eclectic selections from the deeper recesses of Stones Album archives to satisfy the most demanding of Buffs, all performed with the same vibrantly authentic attack and raw energy that characterised the original Stones shows in their prime. For those who witnessed the Stones - Brian Jones et al - in their hey Day - and let's face it, if you do recall it chances are you were never there in the first place- this is a chance to revisit lost youth, for the rest, nows your chance to see what all the fuss was about.